A local TV station in its evening news telecast yesterday (February 25), reported that an unidentified gang that had come in a white van abducted a person named Muththusami Ilankoowan alias Sami at Pettah, Colombo on the same day evening. According to this TV station the person who was a holder of a Singaporean passport had been accommodated at a hotel on Kadireshan road before getting "disappeared". Media personnel of this TV station who seemed to have got the first hand information on this "disappearance", quickly inquired from the police media spokesman who was only able inform them what he knew at the time. Later, the police spokesperson informed relevant media station that the person that it was referring as disappeared was actually a suspect arrested by the police. However, the media station carried out the same story spinning it as an abduction that carried out by the government giving less prominence to the police spokesman's clarification. A senior intelligence official speaking exclusively to defence.lk said that Muththusami Ilankoowan is a number one LTTE terrorist who is suspected to have a hand in many civilian massacres carried out by LTTE in the south. 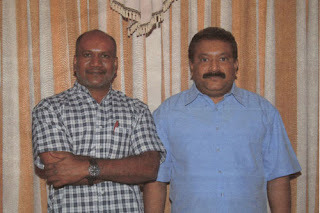 Muttusami, is a Sri Lankan born Tamil, who has strong connection with terror chief V.Prbhakaran, and also with LTTE's international wing leaders such as Castro , Kumaran Padmanadan, David and Iyyanna. The suspect has his own shipping line by which he is said to be promoting cross border terrorists activities of LTTE as well as of other international terrorist organizations that work hand in hand with LTTE, the intelligence official said. As proof for his claim the intelligence official gave defence few pictures of the suspect taken with the kingpins of the terror organizations. It should be noted that counter terrorist warfare is not the same as conventional warfare and therefore has its own methods of dealing with the enemy. For instance, the arrest of Muttusami though perfectly legal, it has been made in a swift manner than a normal arrest in order to prevent accomplices of the suspect getting alarmed. However all such measures taken by the security forces are aimed at saving the lives of civilians than anything else. On the other hand, it is natural for the terrorist accomplices to get disturbed on such arrests and to take whatever action to prevent them. Therefore, it is high time for all peace loving Sri Lankans to comprehend reality that what agitates those terror accomplices are actually attempts aimed at saving lives of innocent.